On July 13, 2013, George Zimmerman was found not guilty in the murder of Trayvon Martin, an unarmed African-American 17-year-old walking home from a 7-Eleven. What The Washington Post and other media outlets had dubbed “the trial of the century” was over, with a deeply unsettling verdict. In the fifteen months between Trayvon’s death and the beginning of the trial, people across the country had taken to the streets, as well as to newspapers, television and social media, to decry the disregard for young black lives in America. For them—for us—this verdict was confirmation. A group of 100 black activists, ranging in age from 18 to 35, had gathered in Chicago that same weekend. They had come together at the invitation of Cathy J. Cohen, a professor of political science at the University of Chicago and the author of Democracy Remixed: Black Youth and the Future of American Politics, and her organization, the Black Youth Project. Launched in 2004, the group was born as a research project to study African-American youth; in the decade since then, Cohen has turned the BYP into an activist organization. The plan for this meeting was to discuss movement building beyond electoral politics. Young black voters turned out in record numbers in the 2008 and ‘12 elections: 55 percent of black 18-to-24-year-olds voted in 2008, an 8 percent increase from 2004, and while a somewhat smaller number—49 percent—voted in 2012, they still outpaced their white counterparts. But how would young black voters hold those they had put in office accountable? And what were their demands? This group, coming together under the banner Black Youth Project 100 (“BYP100” for short), was tasked with figuring that out. As with any large gathering, people disagreed, cliques were formed, and tensions began to mount. The organizers struggled to build consensus within this diverse group of academics, artists and activists. And then George Zimmerman was acquitted. The energy in the room changed. “A moment of trauma can oftentimes present you with an opportunity to do something about the situation to prevent that trauma from happening again,” said Charlene Carruthers, one the activists at the conference. The police department in Sanford, Florida, was slow to act in the aftermath of Trayvon Martin’s killing. It took forty-five days for the police to arrest George Zimmerman; although he had admitted to killing Trayvon and had been brought in for questioning the night of the shooting, the police appeared to have accepted his word that he’d shot Trayvon in self-defense and failed to charge him. As the weeks passed, thousands of people took to the streets in frustration. One of them was Phillip Agnew, who worked at the time as a pharmaceutical sales representative. Along with a couple of friends, he organized a group of college students and recent graduates from across Florida for a three-day, forty-mile march from Daytona Beach to Sanford to demand justice for Trayvon. When the marchers arrived, Agnew said, the police sat down with some members of the group, who demanded that they arrest George Zimmerman and form a blue-ribbon commission to investigate the shooting. The department’s response was to shut the police station down for the day. “That march solidified our bonds,” Agnew said. Shortly thereafter, he organized a conference call with nearly 200 other activists to discuss how to pressure the police to arrest Zimmerman. This was the start of the Dream Defenders. The injustice of the acquittal shook the Dream Defenders, and on Sunday morning, members of the group convened in Tallahassee, where they occupied the state capitol building. “We thought of the tactic before we even thought of what we were going to demand,” Agnew said. Initially, that didn’t matter: their mere presence in the capitol was enough to garner national media attention. Civil-rights legends like Jesse Jackson, Harry Belafonte and Julian Bond joined them, as well as hip-hop artist Talib Kweli. “We were going on the fly a lot during that time,” Agnew said. “But we knew we had to go to a seat of power and confront a person or a body of people that could give us what we wanted.” Over the course of the monthlong protest, the Dream Defenders crafted “Trayvon’s Law,” an ambitious package of bills calling for an end to the school-to-prison pipeline and racial profiling, as well as the repeal of “Stand Your Ground,” the self-defense law that had come under scrutiny after Trayvon’s death. While the bills were not introduced, the Dream Defenders met with several supportive legislators to discuss them. As a nation, we find ourselves celebrating the fiftieth anniversary of many of the achievements of the civil-rights generation, which won major legal victories against institutionalized American racism. We have commemorated (or will soon) the March on Washington, the Civil Rights Act of 1964 and the Voting Rights Act of 1965. Civil-rights leaders of the 1950s and ’60s have become the African-American version of the Greatest Generation: throughout my childhood, I was taught to revere them. Each generation of African-Americans born after this period owes its opportunities for success to the brave men and women who organized on the front lines of violent racism and oppression to secure even a semblance of freedom. But as I got older, the message became less about respecting our elders for their sacrifices and more about chastising my generation for not doing more. We were selfish and apathetic. Why hadn’t we lived up to the standard set by our civil-rights-era forebears? Despite its undeniable impact, the civil-rights movement didn’t solve the issue of racial injustice. The world that young black people have inherited is one rife with race-based disparities. By the age of 23, almost half of the black men in this country have been arrested at least once, 30 percent by the age of 18. The unemployment rate for black 16-to-24-year-olds is around 25 percent. Twelve percent of black girls face out-of-school suspension, a higher rate than for all other girls and most boys. Black women are incarcerated at a rate nearly three times that of white women. While black people make up 14.6 percent of total regular drug users, they are 31.2 percent of those arrested on drug charges and are likely to receive longer sentences. According to a report issued by the Malcolm X Grassroots Movement, which used police data as well as newspaper reports, in 2012, a black person lost his or her life in an extrajudicial killing at the hands of a police officer, security guard or self-appointed vigilante like George Zimmerman every twenty-eight hours. Carruthers and Agnew, both 29, are members of that post-civil-rights generation, as am I. We millennials are charged with continuing the fight against the system of racism that has been the defining component of the black American experience for centuries. We come after civil rights, after Black Power and after the hip-hop generation. And the perception that millennials are apathetic isn’t entirely fair. We protested the war in Iraq. We volunteered our time in clean-up efforts after Hurricane Katrina. We took to the streets in support of the Jena Six. And we’ve joined organizations fighting for progressive causes. But this work had been taking place in isolated pockets. What millennials had yet to achieve was the formation of a sustainable national movement. Then Trayvon Martin was killed. Protests sprang up all across the country, and his name became a rallying cry. 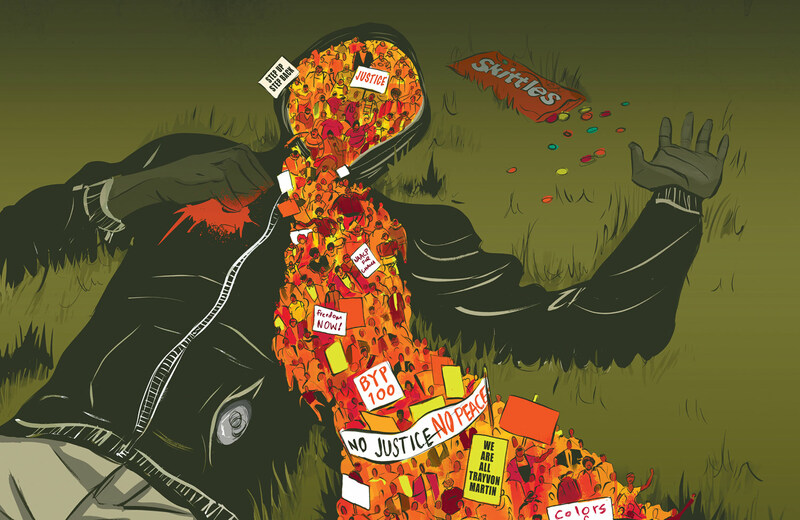 Trayvon’s death ignited something durable in a considerable number of black youth. Whatever apathy had existed before was replaced by the urge to act, to organize and to fight. Millennials were ready to build their movement. This past May, I traveled to Chicago for the “Freedom Dreams, Freedom Now!” conference, hosted by a number of organizations, including BYP100, on the campus of the University of Illinois at Chicago. The conference was intended as an “intergenerational, interactive gathering” of scholars, artists and activists commemorating the fiftieth anniversary of Freedom Summer and discussing contemporary social-justice organizing. The opening plenary featured a keynote address by Julian Bond, a co-founder of the Student Nonviolent Coordinating Committee and former board chair of the NAACP. He presented a history of Freedom Summer, the SNCC-led movement to register voters and get black people to the polls in Mississippi, before a premiere screening of the PBS documentary Freedom Summer, directed by Stanley Nelson. But the aim of the conference wasn’t just to reminisce. It was a precursor to Freedom Side, a collective that includes members of BYP100, the Dream Defenders and United We Dream, an immigrant-youth-led organization, as well as more established groups like the NAACP and AFL-CIO. Before the conference, as part of the Freedom Summer celebration, the Dream Defenders hosted “freedom schools” throughout Florida, talking to young people about criminalization, mass incarceration and the school-to-prison pipeline. Voter registration drives were also held across the country. The day after the conference ended, BYP100 hosted an organizer-training event at the University of Chicago. Early on, the attendees were split into two groups, and the two sides engaged each other in a call-and-response chant that referenced historical greats like Nat Turner, Angela Davis, Ida B. Wells, Mumia Abu-Jamal and Fred Hampton. But even as they paid homage to their history in song, these young activists had their eyes on the future. Members led sessions on personal narratives in organizing, how to handle interactions with police officers, and building political power. “I think we’re seeing different types of organizing [taking] shape, and I think we’re going to continue to see that—especially with the evolution of social media and technology,” said Dante Barry, deputy director of the Million Hoodies Movement for Justice. The group, founded in 2012 by Daniel Maree, drummed up attention for a Change.org petition, created by Howard University Law School alum Kevin Cunningham, calling for a criminal investigation into Trayvon Martin’s death. It collected over 2 million signatures—at the time, the fastest-growing petition ever on the Internet. Barry, 26, joined the Million Hoodies Movement in October 2013. He points out that if not for social media, Trayvon Martin’s death could have languished in obscurity. While the audiences for these new groups may not be larger than the older ones’—the Dream Defenders has more than 27,000 Twitter followers; the NAACP has over 74,000—the newer groups use Twitter to hear from, not just talk to, their members. The Dream Defenders hosts Twitter discussions about its key issues, including gun violence, the criminalization of black youth and the prison-industrial complex. Community cultivation is vital as these organizations take on the challenge of long-term movement building. In February, Agnew and others put together a Tumblr called “Blacked Out History,” featuring members’ artwork. “We were born out of [the Trayvon Martin] murder, but that didn’t become our focus,” Agnew said. Trayvon Martin’s killing deserved all of the attention it eventually received, but elevating Trayvon as a singular martyr risks portraying the struggle of this new generation of activists as the exclusive domain of black men. That would repeat the missteps of past generations. While black women were often responsible for most of the practical work involved in organizing, they were poorly represented in leadership positions, and their concerns were all too frequently sidelined. Carruthers sees this dynamic playing out today. “A lot of people rallied across the country in the aftermath of Trayvon Martin,” she observed. “Not as many rallied around the killing of Renisha McBride.” McBride, age 19, was killed on November 2, 2013, in Dearborn Heights, Michigan. Looking for help after being injured in a car crash, she appeared on the porch of 54-year-old Theodore Wafer, who opened his front door and shot her. Wafer is white; his defense team argued that he believed McBride was breaking into his house. A rally was held that weekend, with local residents calling for Wafer’s arrest, but the level of outrage and media attention didn’t come close to what it was for Trayvon Martin. “That’s a reality,” Carruthers said, “and as an organization invested in freedom and justice for all black people, we are equally as committed to elevating the stories of black women and girls.” To this end, BYP100 uses a “queer, feminist/womanist and economic-justice approach” to consider issues from the position of how they affect the people most marginalized in their community. It’s a deliberate rebuke to the charismatic male leadership that centers on the concerns of black men. Just a couple of weeks ago, the streets of Ferguson, Missouri, exploded after 18-year-old Michael Brown was shot and killed by a police officer on August 9. Brown, who would have started college the following Monday, became the latest unarmed black person to be killed by police. In the wake of his death, and with little information forthcoming from the Ferguson Police Department, residents took to the streets, first for a vigil, later in protest. The underlying crisis—economic and educational disparities, the lack of political representation, constant harassment by the police—boiled over. Nights of unrest followed, characterized by the aggressive presence of a militarized police force as well as some rioting and looting, as the nation once again came face to face with its centuries-long tradition of criminalizing black bodies. In response to the shooting, BYP100 asked supporters to submit videos describing how they have been profiled or harassed by police. “Beyond our current frustration and anger, our memory hums as our ancestors call out to us. We will redeem their suffering through collective work for liberation,” the group said in a statement. “Stoicism, respectability politics and piecemeal measures of progress are not working.” Here, perhaps, is the new movement’s first big test. Editor’s Note: This piece initially credited Daniel Maree with creating the Change.org petition calling for a criminal investigation into Trayvon Martin’s death and then was incorrectly changed to say a group of Howard University students created it. In fact, the petition was created by Howard University Law School alum Kevin Cunningham. The text above has been corrected and we regret the errors.